Conceptually, a decade isn’t always a 10-year period that begins and ends with a year ending in “1” or “0.” It can instead be a period framed by watershed events. Some say “The ’60s” began when JFK was assassinated and ended with The Rolling Stones’ disastrous Altamont concert, and “The ’70s” began when Nixon was re-elected and ended when the Iran hostages were released. By that logic, maybe the ’80s became “The ’80s” when Crockett and Tubbs rolled through a dark Miami night with streetlights reflecting off their hood and hubcaps, while Phil Collins’ “In The Air Tonight” simmered on the soundtrack. There are multiple legends about how Miami Vice came to be. The most famous is that NBC head Brandon Tartikoff scrawled “MTV Cops” on a napkin, then went looking for someone in the NBC stable to develop the idea, eventually settling on Hill Street Blues writer-producer Anthony Yerkovich. But Yerkovich has always claimed that even before Tartikoff approached him, he was already drafting the idea for what would become Miami Vice, inspired by news stories he’d been reading about the booming drug trade on Florida’s Gold Coast. (In fact, Gold Coast was the show’s original title.) And nearly everyone who wrote about Miami Vice in the ’80s pegged the show’s real creative force as executive producer Michael Mann, who’d been a staff writer on Starsky And Hutch with Yerkovich, and had been called away from a budding career as a feature-film director to help bring some of his neo-noir style to this bold new NBC experiment. Mann actually never directed a single episode of Miami Vice, and is only credited as a writer on one script. The two-hour pilot that established the show’s style and tone was scripted by Yerkovich and directed by Thomas Carter, the former White Shadow actor who helmed the snazzy pilot for St. Elsewhere two years earlier. But Mann helped give Miami Vice its defining pastel look by decreeing “no earth tones” to the set and costume designers, and Mann was chiefly responsible for guiding the show from its seventh episode (by that point, Yerkovich was gone) to the end of its second season (after which Mann was more focused on his own new show, Crime Story). Mann certainly deserves a lot of credit for Miami Vice becoming a sensation. As for Tartikoff’s “MTV Cops” suggestion—well, he wasn’t taking that big of a risk there. Network executives are supposed to pursue the youth demographic, and the youths of the early ’80s were embracing MTV as the leading indicator of style and cool. But Tartikoff seemed to understand that bringing MTV to network primetime would take more than a few skinny ties and some extra cans of mousse. He allowed Miami Vice a bigger budget, to pay for the rights to popular songs, and to shoot extra footage for montages set to those songs. Mann then brought in Czech musician Jan Hammer, an electronic-music virtuoso whose moody pieces added a modern, almost European feel to Miami Vice, much like Tangerine Dream had done for Mann’s critically acclaimed 1981 film Thief. All those creative influences—Yerkovich’s ripped-from-real-life Miami flavor, Mann’s cinematic style, and Tartikoff’s audience-grabbing sizzle—are evident in Miami Vice’s opening-credits sequence, which is one of the best of its kind. As Hammer’s theme song, well, hammers, the screen flashes glimpses of palm trees, flamingoes, racetracks, jai alai, choppy waves, jiggling breasts and derrieres, all in a rush. The credits leave no doubt about where the show is set, or what it’s selling: pretty pictures and decadence. Then, just when the music approaches a crescendo, it comes to an abrupt close, over a shot of the Miami skyline at night. There’s an ominousness about that—a sense that all those trappings of luxury come at a dark, steep price. The credits don’t lie about what Miami Vice is. The cold open of the first-season episode “No Exit” doesn’t, either. The series’ heroes, James “Sonny” Crockett (played by Don Johnson) and Ricardo Tubbs (Philip Michael Thomas) begin the episode by staking out a sleepy, beach-adjacent neighborhood along with their colleagues in the Miami PD’s vice division, waiting for an undercover operation to culminate in the arrest of some arms dealers. But the bust goes sour, leading to a shootout in the streets, and the revelation that the bad guys have gotten their hands on heavy-duty machine guns. This sets the episode’s plot in motion. “No Exit” was reportedly originally titled “Three Eyed Turtle” (until someone in NBC’s Standards & Practices department apparently consulted whatever the 1984 version of the Urban Dictionary was, and found out what that term means). It was written by Maurice Hurley from a story by Charles R. Leinenweber, and the episode was directed by David “Hutch” Soul. (His ex-partner, Paul Michael “Starsky” Glaser, directed an earlier episode in the first season.) It aired before Glaser’s episode on November 9, 1984, though, and because “No Exit” quickly became one of Miami Vice’s signature episodes, it was repeated twice in 1985, and once more in 1986. “No Exit” marks something of a turning point in Miami Vice: The first six episodes of the series were inconsistent in tone—sometimes showing what became the familiar, worldly Miami Vice attitude, and sometimes coming off as a conventional, corny mid-’80s cop show in flashier clothes—but by episode seven, Mann had taken over as the sole executive producer, and Edward James Olmos had come on board to play Crockett and Tubbs’ serious-minded boss, Lt. Martin Castillo, which helped add gravitas. “No Exit” is primarily remembered for bringing a previously unknown actor named Bruce Willis to national attention. Willis was 29 years old when he guest-starred in “No Exit,” and his acting résumé to that point had been limited to off-Broadway theater, a Levi’s commercial, and uncredited extra work on a few movies. Willis came out of nowhere when he played sinister gun-runner Tony Amato in “No Exit,” but made such a strong impression that only a year later, he was starring in his own show, ABC’s Moonlighting. The tough, twisty, uncompromising plot of “No Exit” pays off the promise of Miami Vice’s best early episodes. 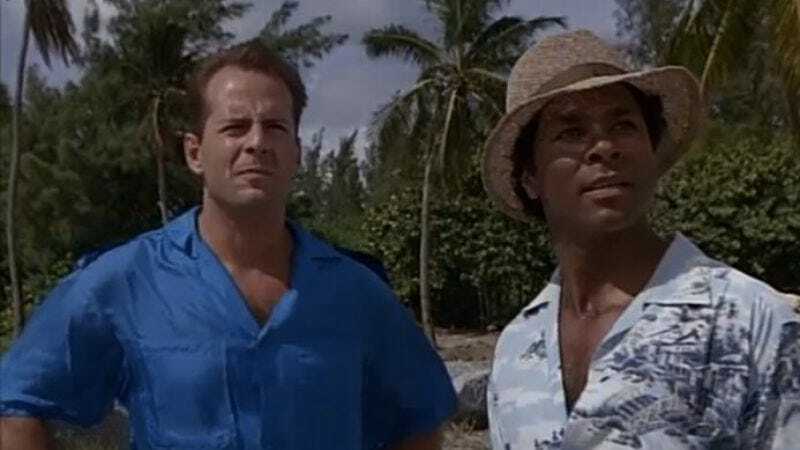 After Crockett and Tubbs learn that Tony Amato is responsible for distributing the machine guns that almost mowed them down in the opening, they get a court order to bug Amato’s oceanfront house, which they do in a tense sequence set to Hammer’s jittery synthesizer. This is the Michael Mann touch in spades: a sparely furnished high-end abode, some slick professionals, and a soundtrack that suffuses everything with poetic melancholy. The drama stems from the time element: These cops know they have only a limited window to take down a supervillain who’s fallen into their laps. They set up surveillance on Crockett’s boat, but there two major complications. First, they learn that Amato’s weapons were stolen from a U.S. government armory, and that his cache includes shoulder-mounted surface-to-air Stinger missiles, which means that while the Miami PD is watching Amato, the feds are watching the Miami PD, laying out precise parameters for the entire operation. The other complication is that Amato is a wife-beater. On their phone-tap, Crockett and Tubbs hear a call from Rita Amato (played by Katherine Borowitz, a year before she married her current husband, John Turturro). It turns out that Rita is planning to hire a hitman to kill Tony, and if she follows through, the entire sting will be compromised. Meanwhile, Tubbs is posing as an arms buyer—with an outrageously exaggerated “island” accent—and getting a demonstration from Amato’s associates on how the Stingers work, including a tip on how to disarm the warhead and make it look as though an airplane just fell out of the sky due to an unexplained malfunction. Later Tubbs meets Amato in a public restroom to finalize the deal, and Amato frisks Tubbs to make sure he’s not wearing a wire, which prompts Tubbs to slam Amato against the sink and frisk him. “Just checking,” Tubbs says, mocking Amato’s precaution, while also letting some of his own feisty personality show through the disguise. Finally, the cops make their move, with Crockett swinging Doug Fairbanks-style onto a tanker to make the arrests, while Phil Collins’ “I Don’t Care Anymore” pounds in the background, serving as a kind of callback to the moment in the pilot when Crockett and Tubbs rode into action to “In The Air Tonight”—a moment that first signaled to audiences and critics that Miami Vice had something to offer that few other TV programs on the air in 1984 could match. In this critical period in history, when it is absolutely necessary to know whom we live next to, and thus among, what does Miami Vice most often show, and what do we most often see? Only a feverish circulation of bodies and drugs all moving to the beat of a Genesis song; only a cash flow that entices, kills, and entices again; only late capitalism’s latest version of ourselves. This was probably intentional; Yerkovich purposefully set out to make a show that would break from the sensitive-hero mode that dominated the previous decade. No Alan Alda, Hal Linden, Ed Asner, or Daniel J. Travanti types allowed; Yerkovich wanted unapologetic men of action. “The cop show just graduated to the ’80s!” the NBC promo department trumpeted in the early days of Miami Vice. What that actually meant wouldn’t become clear until after the decade was over. Even now, there’s some dispute over what Miami Vice stood for. The show could be critical of the Reagan-era government, but in the same way a lot of ’80s action shows and movies were: grumbling about ineffectual bureaucracy while saluting the men within the system who do something. “No Exit” was especially on-message in that regard. While going through Amato’s house, Crockett and Tubbs raise their eyebrows at the arms-dealer’s catalog, titled The Arsenal Of Democracy. But their discovery turns out to be foreshadowing. After the Miami cops arrest Amato, the feds order his release, saying they need Amato in play, funneling weapons to Central American “freedom fighters.” Crockett is disgusted, though he’s just as unhappy with the way justice is ultimately done, when Rita shows up with a gun and shoots her husband. Crockett yells, “Nooooo….” in slow motion. Freeze frame. Cut to black. The legacy of Miami Vice is tough to pin down. The show could be seen as a step on the path toward the more mature TV dramas of today, except that it really isn’t any more sophisticated than Lou Grant or Hill Street Blues, two of the dramas Yerkovich was intending to supplant. That lack of sophistication didn’t necessarily harm Miami Vice; its first two seasons were among the best TV of its era. But in terms of storytelling and subject matter, Miami Vice wasn’t breaking as much new ground as the hype allowed. Style, though, is another matter—and not just filmmaking style. Frankly, when people think about Miami Vice today, most likely what first comes to mind are the white jackets, the pink ties, and the fashion designer’s vision of “casual.” The Miami Vice clothes are so iconic that when a sitcom today wants to signify “the late ’80s” in a flashback sequence, the costume designers just make the male star look like Don Johnson. “No Exit” is remarkably fashion-forward: True, Rita Amato looks strangely dowdy in her best Diane Chambers frock, but Tony Amato’s puffy, high-waisted pants and Sonny Crockett’s striped T-shirt look like they stopped off in Miami on their way from the runway to a catalog. That’s the way it often goes with pop-culture revolutions: What survives isn’t what everyone thought was so important about them at the time. Partly that’s because such revolutions are unplanned, which means that even their most ardent followers have a hard time articulating the reasons for their devotion. Because they didn’t even know what they were waiting for until it appeared.